It's officially winter. Although there isn't a lot of snow, it's freezing. 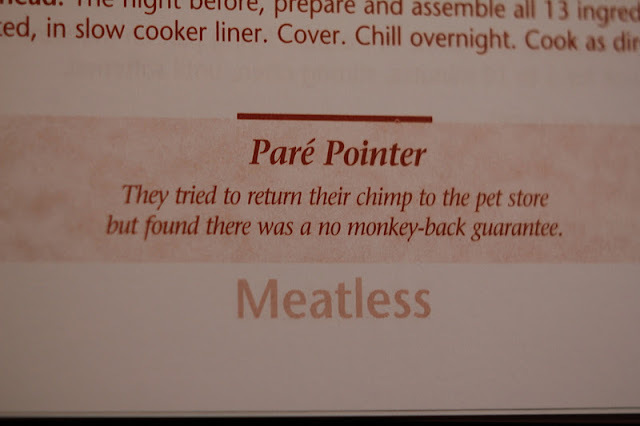 As such, I've been trying to find meals to make that don't involve going outside to BBQ. I picked up a Company's Coming: Slow Cooker Dinners while waiting in line at the grocery store and saw a recipe for Beer and Bacon Chicken. Since The Hubby and I enjoy all three things in the title, I bought the book to give it a try. The recipe. The only thing I had to pick up was bacon. It's nice when you have most of the ingredients at home already (I used chicken breasts instead of drumsticks). Take the 8 ingredients listed after the chicken and combine in a 4-cup measuring cup (including the bacon but it wasn't ready when I took this pic). Then put the chicken in a plastic bag to coat with flour. Don't be alarmed by the MASSIVE SIZE of the one that I used, it was the only one in the house. But seriously, both of my dogs could probably fit inside. Or three dozen bagels. I bought them by accident. Place the chicken breasts in the slow cooker and pour the mix over them. Then set the timer for either 4.5 hours on high of 8 hours on low. We used the high setting. Halfway through! By this time, our entire house smelt like beer. The Hubby was happy. Voila! Beer and Bacon Chicken with batsami rice and a cheddar garlic scone. I'm not going to lie, this recipe ROCKS and will be going into our rotation. It was super easy and the chicken was so tender that we didn't even need to use knives. It basically fell apart when we tried to fork it. Mmmmmm. 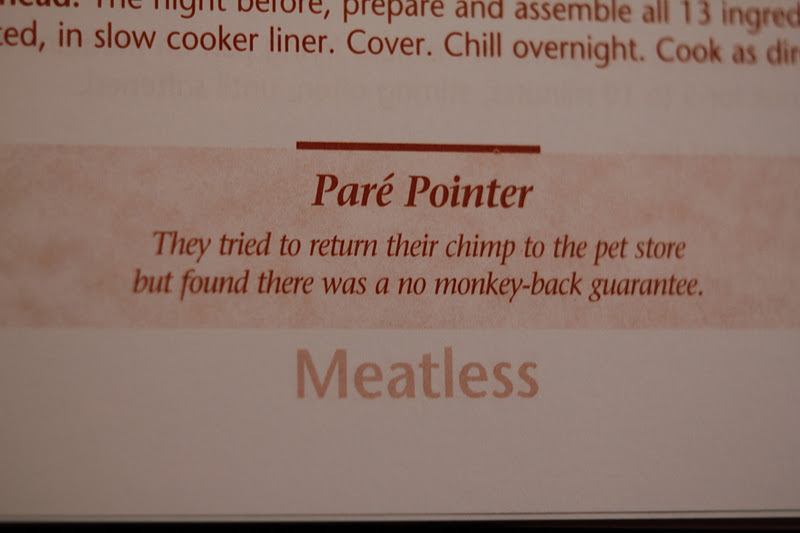 The cookbook is written by Jean Paré and apparently ole Jean-y thinks they're a regular comedien because, underneath the Beer and Bacon Chicken recipe was a little joke. Gotta love cooking with a side of comedy! Yay! Just got a new crock pot and will have to try this... sadly the only thing I don't have are drumsticks. Ha. Bacon- always in the freezer!